Learn how to burn belly fat and become more appealing to women here on the Florida beach. Male belly fat is a turn-off to women. Get rid of love handles and build lean muscle. Single guys come to the Florida Gulf Beaches for two reasons: to relax inexpensively...and to meet good-looking women. If you are planning a Florida beach vacation, you want to start as early as possible to lose belly fat and eliminate love handles. Girls on the beach see guys who look soft, with no definition, as lazy and undisciplined. While this may be a completely illogical perception, it is their reality...and that is the only one that counts. Checkout any talk show, or survey in a women's magazine...and you'll find chicks want guys who look, fit, lean, and athletic. The best way for men to get rid of belly fat is through a comprehensive program of (1) good nutrition (2) regular and consistent weight training, and (3) 30-40 minutes of continuous activity each day. Of the three elements in this strategy, good nutrition will be far more responsible for male fat loss than the physical components. Despite all of the hype you read on the Internet, you CANNOT exercise-off several inches of fat. You must establish a small caloric-deficit each week in order to eliminate belly fat. * If you want to learn how to burn belly fat, you must commit to reducing calories by getting sugar foods and processed foods (including bread) out of your diet. * You must understand that it took several years for you to put on fat...and it will take some time to lose it. Losing 1-2 pounds each week is the safest way to go. Over the course of 6-9 months (that's why you start early), you will see a tremendous change in your body. * You must commit to drinking more water each day. This will help with fat oxidation and removing toxins from your body. Work up to drinking a gallon throughout the day. Take it slow. * You must commit to learning which foods build muscle and which foods are easily stored as fat. Know EXACTLY what foods and situations sabotage your fat loss efforts. * You must commit to a structured program of weight training. It will build lean muscle mass to naturally increase your metabolism. * Do NOT believe the hype that you will swap 20 lbs of fat for 20 lbs of muscular bulk. That is NOT reality. However, your workouts will definitely change how you look and it will be for the better. * Mild cardio will work wonders for you. Try to engage in some form of continuous activity each day. Mindless jogging before dawn will not help you much, except in the beginning. You want to get strong enough to begin interval training. 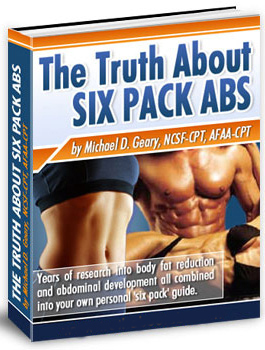 The Truth About Six Pack Abs is pretty much the bible on getting rid of belly fat for men here on the Florida beach. * Mike does NOT believe in endless crunches or leg raises. * He does NOT believe in idiotic fat pills or expensive supplements. * This is a common sense program that is easy to initiate and stick with. * It provides you with strong nutritional advice and a combination of exercises that will help you burn belly fat. * Mike's book is 106 pages of concrete information on how to get rid of belly fat so that you can see your abs. * The Truth About Six Pack Abs provides over 20 of the best exercises for your abdominals, but focuses intently on strength training to help you build lean muscle mass. If you have been frustrated by the amount of misinformation on how to burn belly fat, Mike book will definitely give you clarity...and results.